is still dealing with an archaic way of thinking and levels of discrimination that are totally unacceptable, and act now rather than rest on our laurels and congratulate ourselves on how far we have come. At St George’s we embrace equality and seek to educate our young people in many areas of social justice. International Women’s Day is an excellent opportunity to show our young people, both boys and girls, that the world celebrates equality, diversity and opportunities for everyone. We are proud to be a co-educational school where we can celebrate and embrace all that both genders offer, and International Women’s Day permits us to highlight the contribution our young women bring to our school. They inspire, motivate and challenge our community and are future leaders – we cannot be more thankful. Centre on Thursday 8 March. Aside from the benefits of the actual activities to support our students transition into secondary school, one of the things I was most impressed with was our sense of community. A colleague from another school shared with me a comment from a third party who was present at the event, someone that had never seen or heard of our school: “Now that is a community!” This statement was without any prompting, but simply a ‘feeling’ they got from our students and staff and watching them interact with each other. How amazing! As they say, culture will eat strategy for breakfast every day of the week! educate and guide our students as to the dangers and pitfalls of the cyber world, it is in our homes that is the first line of defence. As we move forward, the School will be seeking to engage specialists in this field, and others, to run forums for parents to support you in managing this everchanging landscape. Writing Study Notes that will help students revise for tests and exams is a skill that many students find difficult to master. There are many methods out there and include hand written notes, typed notes, mind maps, dot points and other methods that will assist recall. An often debated topic is should study notes be handwritten or typed? There are pros and cons to both methods, but students must remember that tests and exams are hand written under our current educational system. The chart linked here www.artofsmart.com.au lists the pros and cons of each method. Students will need their WA student number and other personal identification information. It is important that students check that their information is correct as changes cannot be made to subjects after Thursday 4 April. Part I of the Year 12 Information Handbook is now available on the SCSA website at https://senior-secondary.scsa.wa.edu.au/further-resources/year-12-information I encourage all Year 12 students to use the handbook as a reference point as they work towards their WACE. All students will receive an interim report this term. The reports will be available in SEQTA after 3.30 pm on Tuesday 26 March. Also on this date parents will receive an email with a link directing them to the portal where they will be able to book appointments to see their studentsâ&#x20AC;&#x2122; teachers at the parent teacher evening on Thursday 4 April from 1:30 pm until 6:30 pm. The schools first Junior School Social for Year 7 - 9 will be taking place on Friday 5 April. This event will offer food, soft drinks, karaoke, DJ, access to unlimited pictures at the photo booth and various activities between Level 4 as well as the Rooftop. These two venues will be transformed into appealing areas where students will be able to relax, dance or catch up with their friends. 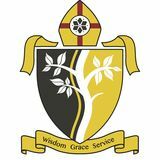 At St George’s Anglican Grammar School, we encourage the use of technology during lessons for the enhancement of students educational experience. Students may carry their phone on them during the day; however, it must be on silent or switched off. Phones may only be used on school premises or at school activities if permission is given by the supervising teacher. This includes restricting phone use before school and during recess and lunch. We encourage the use of phones for educational purposes; for example, voice recording a section of a lesson or photographing the board (with permission), but any use that is not for educational reasons is prohibited. Our Senior School Social for Years 10 – 12 will be taking place on Thursday, 11 April on The Crystal Swan. The Crystal Swan is a highly sought after school formal cruise Phones will be confiscated for the remainder venue with quality dining, exceptional service, of the day from students found to be stunning views and an overall unique misusing them. experience. We ask that families support this by ensuring The river cruise on the Crystal Swan will that all contact with your child during school include; DJ, fully enclosed upper deck, fully hours goes through the school. If you enclosed lower deck with large dance floor, require them to have information before the magnificent panoramic views from both end of the school day please contact levels of the City Skyline and spacious upper reception on 9312 0800 and we will pass a and lower deck for mingling. message to them. As a school, we always encourage our students to get involved in such events; it allows them to develop friendships, make memories and experience something new. Students have been encouraged to hand their forms in if they plan on attending these events. The Year 7’s and 8’s recently attended ‘Thrive’, a leadership conference at the Perth convention centre with over 2500 other students. Throughout the day students had the opportunity to listen to speakers, participate in learning activities and be entertained by local artists. These past few weeks have been very busy with the chapel band performing for the Commissioning of the Guild at St George’s Cathedral and bands and students prepared for the On The Roof Concert. This is always an exciting event and for many students, this will be their first time performing to a live audience. The roof top concert is an amazing experience for students as it gives them an opportunity to perform live, and to watch and support their fellow musicians. 5. What’s your advice for anyone learning Music? Don’t worry about when you start. Philip Glass, a famous movie composer and great pianist started learning at the age of 18, just because he suddenly had a desire to follow the music. Muso Profile - Ronan Dixon 1. What instrument(s) do you play? I play the piano, synthesizer and just about any keyboard type instrument. I additionally play a tiny bit of guitar, but I’m not too great at it. 2. What first got you interested in Music? When I was young, I got a synth for my birthday, the Korg m50. I would jam on it all the time, using the presents and drum patches. After a while, I started getting piano lessons and it developed from there. A big congratulations to Year 8 Surf Lifesavers, Austin, Tom, Sydnee and Koby who competed at the Nipper State Championships last weekend. They took on a massive shore-break when a 3m swell hit on Sunday. Future lifesavers of Perth who have important talents and possess life skills that could really make a difference. Although competing from NWAS Summer Fixtures has been a success different clubs in Perth their bond remains thanks to the dedication and commitment strong and we are proud of your by our students. Even though we have not achievements. achieved too many winning results we have achieved, and we will continue to grow. Well Swimming is such an essential life skill and done to all team players. Our final fixture is that is why it is part of the PE Program. this week against Kingsway Christian Term Oneâ&#x20AC;&#x2122;s UWA swimming program is College. completed and students and families are commended on their organisation. Swimming techniques and fitness improved, and it was pleasing to witness the team work that developed with the swimming program. The PE Program is ending the term with Cricket for Year 8’s at Supreme Court Gardens, Tennis for Years 7 and 9 at Royal Kings Park Tennis Club and Stand Up Paddle Boarding for our Year 10’s where Outdoor Education opportunities highlight leadership, collaborative skills and self-management skills. Mr Racey’s comments express my sentiments exactly! I just want to say that I am so proud of each and everyone of you for your performance, your attitude, your dedication and positive team approach. It was honestly a team effort that brought us to the Championship. Many thanks to the student and staff officials who support in the organisation of the Carnival. The ACC Staff approached me to say how wonderful the student helpers and staff support are from our school. Thank you to the parents who came along on the day and also for your efforts in getting the team to the early morning training sessions and the Swim Meet at Trinity. Preparation and the old saying, “train as you play” really does make all the difference. The School Enrolment Policy requires one full term’s notice in writing prior to the withdrawal of a student from the School. Where such notice is not received, the School will charge an amount equal to the tuition fees for that current term. To avoid fees in lieu being charged, notice of a student’s withdrawal must be received by the School before the first day of the School Term preceding the Term of the student’s departure. If this does not occur, families will be charged the remainder of the current Term, plus an additional Terms fee in lieu. Upon withdrawal of a student from the School, all fees and charges incurred for that student are payable to the School in full within seven days of exit. St George’s uniforms are purchased from Matrix Uniforms Showroom, 1 Hasler Road Osborne Park or online. Uniform fittings are available from 8:30 am to 4:00 pm Monday to Friday. SEQTA The St George’s Anglican Grammar School SEQTA account is not assigned to a staff member and, therefore, is not monitored. Please contact the staff member directly to ensure prompt action to your message. Year 9 parents and students have been enjoying dinners rolling around Perth in an attempt to make it both fun and accessible for more families. The first was held in Canning Vale with 12, the second in Burswood with 28 (and 6 apologies). The third one will be held on Friday 5 April in the Yagan Square Food Hall at 7:00 pm onwards to coincide with the Year 7-9 Social. After that one will be held during May at ‘Coast’ in Port Beach, Fremantle at 7:00 pm. These events are organised by a Year 9 parent with the aim of building community for our students by year group. All Year 9 families are welcome. Please SMS 0409767212 to join us. Reservation made for 30 currently. Should any parent wish to start a similar arrangement in their child’s year group we will be happy to include details in the newsletter. 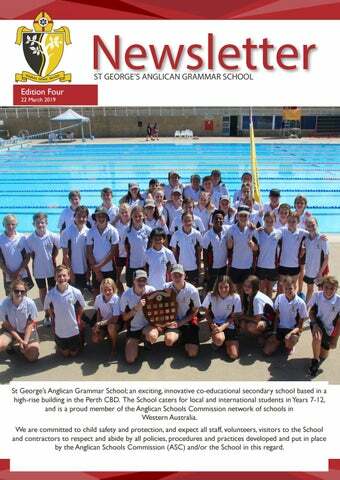 Friday 22 March 2019 - welcome to Edition 4 of the SGAGS School newsletter for 2019. We hope you enjoy reading.